How should schools prepare students for the Information Age? The successful worker of the future - a creative, independent thinker who works well in teams - would seem to be too self-contradictory to be the deliberate product of a school. A century ago, the American educator Caroline Pratt created an innovative school that she hoped would produce such independent thinkers, but she asked herself a different question: "Was it unreasonable to try to fit the school to the child, rather than...the child to the school?” A strong-willed small-town schoolteacher who ran a one-room schoolhouse by the time she was 17, Pratt came to viscerally reject the teaching methods of her day, which often featured a long-winded teacher at the front of the room and rows of miserable children, on benches nailed to the floor, stretching to the back. 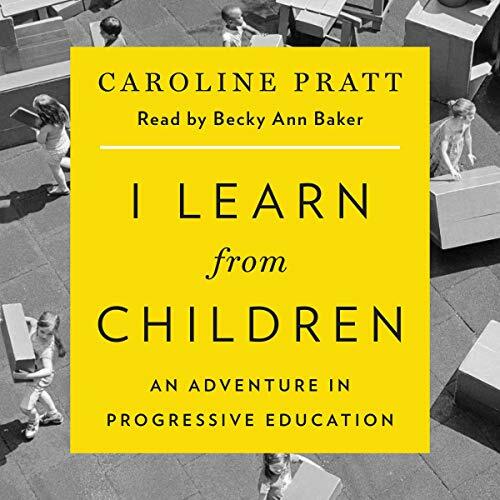 In this classic 1948 memoir, now in its fourth edition, Pratt recounts, in a wry authorial voice much closer to Will Rogers than John Dewey, how she founded what is now the dynamic City and Country School in New York City; invented the maple "unit blocks” that have become a staple in classrooms and children’s homes around the globe; and came to play an important role in reimagining preschool and primary-school education in ways that resound in the tumultuously creative age before us. The 2014 edition features a new introduction by Ian Frazier, as well as a new chapter, "C&C at 100", by former principal Kate Turley, and an afterword by Susan F. Semel. Read by Becky Ann Baker, Ian Frazier, and Kate Turley. City and Country School wishes to thank Kiran Paranjpe, for initiating this production and for assisting in its development. Was very interesting. Seems ,by what was said, that the average cost in this school is income based. Therefore those of modest, lower income no longer apply. If I'm wrong I apologize. Sounds like a school my children would have loved. Thank-you. I really loved the narration. I am a New York City teacher, teaching in Beijing, China. I wanted top say that Caroline Pratt was well ahead of her and OUR time. What the US was experiencing at that time is what the Chinese Public Schools are experiencing today. The ones that have more money send their kids to Montessori schools, which is a modified version of City and Country School. This book over 100 years later can touch hearts and minds, and it has definitely taken me. Creative, yes. But turned pessimistic along the way. Would be revolutionary in its own days.